24 Hour Towing is just one of several services we provide. We can tow virtually anything with wheels (and even things without wheels)! Our drivers are trained & tested to have the needed experience and knowledge necessary to provide you the type of service you deserve. In addition to light, medium, flatbed, and heavy duty towing, we offer many roadside services, accident, recovery, and transportation services. 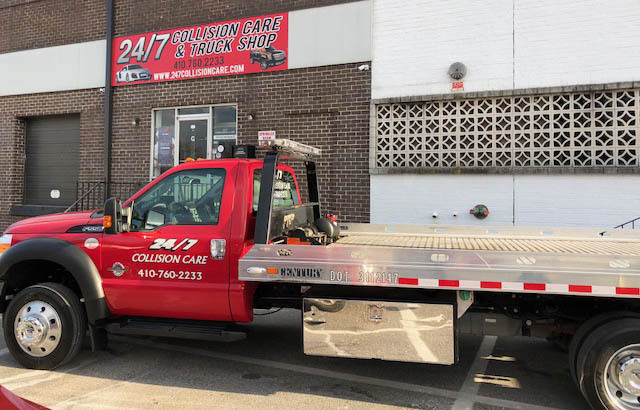 At 24/7 Collision Care, we are committed to providing extremely high quality towing services and more. Please take a few minutes and browse through our site to learn more about us or to request any information. Dealership and Repair Facility "Move-Ins"
Vehicle Impound In the event that your vehicle is impounded by a police department or private party, the following is a general guideline of necessary paper work you will need in order to claim your vehicle. Valid Drivers License and/or Government issued PHOTO ID. All fees to be paid in CASH. If a police hold has been placed on your car by a police agency you must obtain a release from that agency before the vehicle can be released.